In a QGraphicsViews based application, I tried to replace the QGLWidget viewport with the new QOpenGLWidget. I noticed that the view was performing updates all the time. I finally find out that the source of the unnecessary redraws was the update of the status bar of the main window. 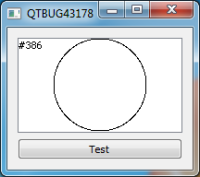 I prepared a sample project which reproduces the issue : after each view redraw, a connection is used to update a counter in the status bar ; with QOpenGLWidget you can notice that the counter will keep increasing, whereas it won't increase when using a QGLWidget or QWidget based viewport (neither with 5.4 or previous versions).